Now that Buy Nothing Day has come and gone, it’s time to start ticking off that holiday gift list. If you’ve got any little ones on that list, you’re going to want to pay close attention. What better way to end Vegan MoFo, than to tell you about one of the best children’s books I’ve read in a long time. Garlic-Onion-Beet-Spinach-Mango-Carrot-Grapefruit Juice is the tale of a not-so-typical family, who lives in a not-so-typical house. Our protagonist, Thora, well, thinks. She thinks a great deal. She might be called the brains of the family. 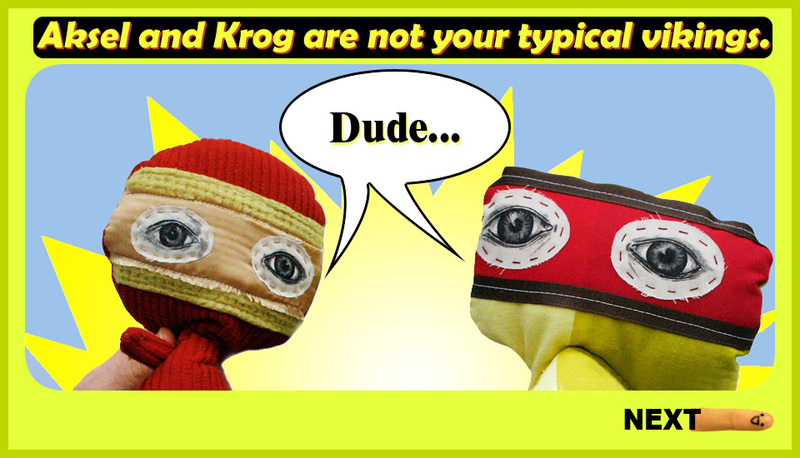 Her two Viking family members, Aksel and Krog, however, are less pensive and a bit more physical. The brawn, if you will. They get pumped. Totally pumped, even. About, well, lots of “stuff” from heavy metal music to kale. These two “non-hairy Vikings” are reminiscent of Bill and Ted in all the best ways. They also get pumped about juicing. Yes, juicing. Thora grows concerned when Aksel and Krog learn about a new ingredient that could make their juice even healthier for them (to get them even more PUMPED! ), because what is good for them, well, isn’t good for everyone, particularly for the little beings about to become collateral damage. There are no good guys, no bad guys, no preaching or judging. Just a family who wants to do the right thing and be healthy. Author/illustrator/publisher VanBalen articulates all this and more through a quirky story with off-beat and unexpected characters and a sense of humor. What could be better? Creativity – Nathalie (can I call you Nathalie?) not only drempt-up the characters, but she’s sewn them into plush doll-protagonists! This is 3-D creativity, not simply a linear story with a beginning and end. Art – The drawings, mixed-media illustrations and photos throughout the book are visually interesting, and do more than simply accompany the story – I think they reflect a child’s imagination (and mine) as they use photos and illustration, which dove-tails nicely reality and fiction. Critical thinking – (ie : questioning the dominant paradigm) – We want to be happy. We want to be healthy. We try to make the right food choices, but is eating everything that could be good for our health a good idea, especially when it harms other beings? Renegade spirit – Ms. VanBalen self-published and created ThoraThinksPress to do it, taking DIY to a supreme level which frankly, gets me pumped! Though Garlic-Onion-Beet-Spinach-Mango-Carrot-Grapefruit Juice is suggested for readers age 6 and up, kids of all ages like to colour, right? I know I do. Check out these free colouring pages that accompany the book. They’ll keep little ones creating and thinking, too. You can also read more about Nathalie or find out more about the book here. 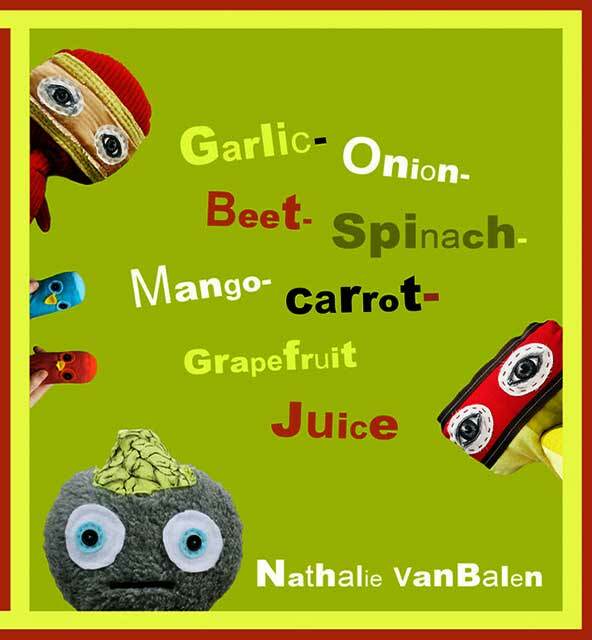 Garlic-Onion-Beet-Spinach-Mango-Carrot-Grapefruit Juice is a visual and intellectual delight – the Dr. Seuss-esque title alone still has me giggling aloud. It would make a wonderful holiday gift for children of all ages, vegan or not. And speaking of gifts, if you’re looking for a unique and handmade original present, visit the Thora Thinks Store and order yourself one of the characters from the book, buttons, or veggie magnets (I really love the magnets). And that concludes this year’s Vegan Month of Food! It was a lot of fun, but whew, am I beat. See you tomorrow for the winners of the tea and chocolate give-aways! Who wants some apricot oat bars? I do! 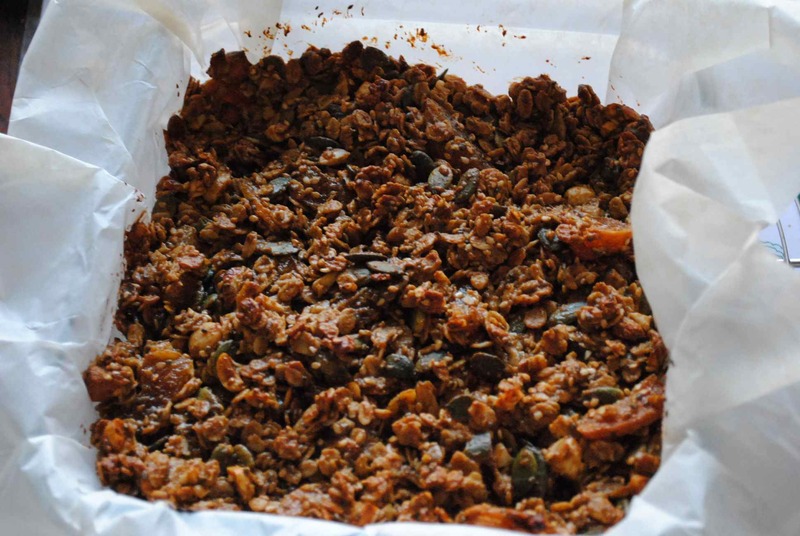 You’ll have some of everything you need in these babies : fibre, vitamins, even iron from the pepitas! 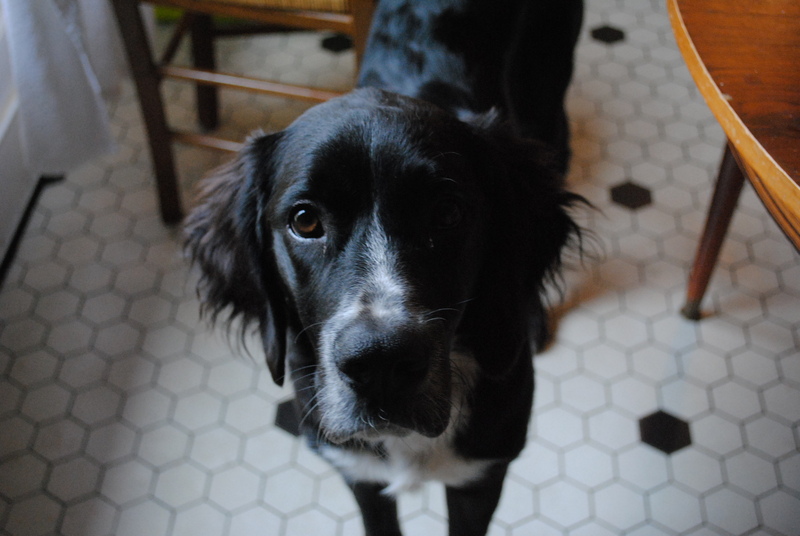 (Libby, I said pepitas!). I like to wrap these individually in waxed paper and keep the wrapped bars in a sealed container. Keeps them fresh and ready to go, perfect fuel for a hike or a long bike ride. 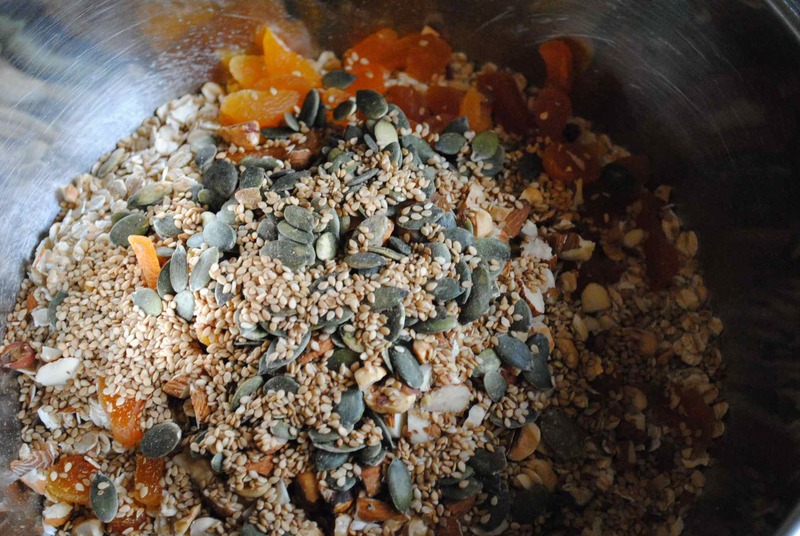 Put all the ingredients from oats to chia seeds in a medium sized bowl and stir to combine. Heat the peanut butter, agave, oil and molasses in a sauce pan over medium heat until it gets bubbly, then pour over the dry ingredients and stir until combined. Resist the temptation to taste, you’ll burn yourself. Pour mixture into a prepared pan (20 x 25 cm) – you can grease it, but I find clean up and detachment easier when I use parchment paper. Let this cool about 15 minutes, then cut into desired size/shape (if you wait until it’s completely cooled, it’ll be harder to cut). Let cool completely before enjoying! These are a little crumbly, if you don’t like that just add more oil (maybe 2 tbsp more) and a little more agave (same) it’ll help hold it together better. These doughnuts are great because they are calorie free, fat free…well, you can’t really eat them. They would make a fun little holiday gift for little (or not so little) ones. I’ve finally put together a How To page, with lots of tutorials and fun things to make and do. Go check it out! 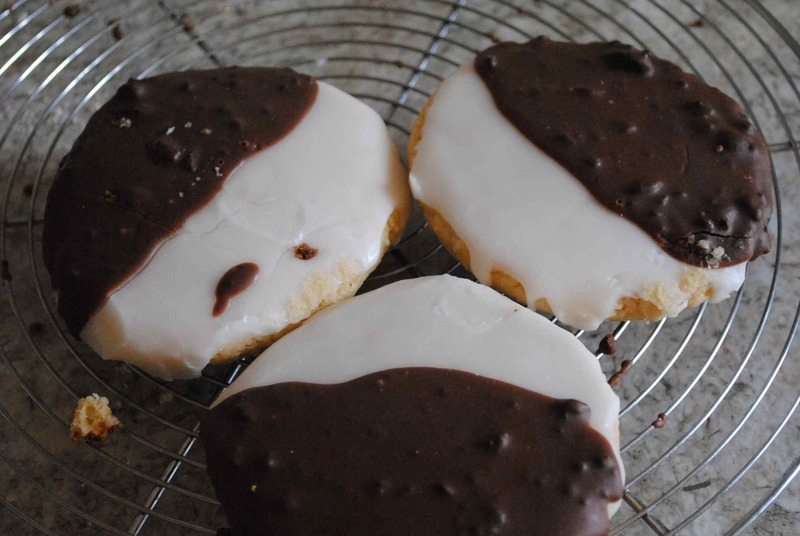 These are the chocolate crinkle cookies and the black and whites from Vegan Cookies Invade Your Cookie Jar. Making these I had lots of help from Guppy and her friend who took turns rolling the cookies in the powdered sugar. The recipe calls for corn syrup to help the cookies to spread. Corn syrup is easy to find in North America, but not here. I used golden syrup since it’s easier to find, but they didn’t spread as much as I’d have liked. I think I have an idea for next time, and I’ll let you know if it works. Taste-wise they were delicious, and Guppy brought some to her teacher who asked for the recipe. 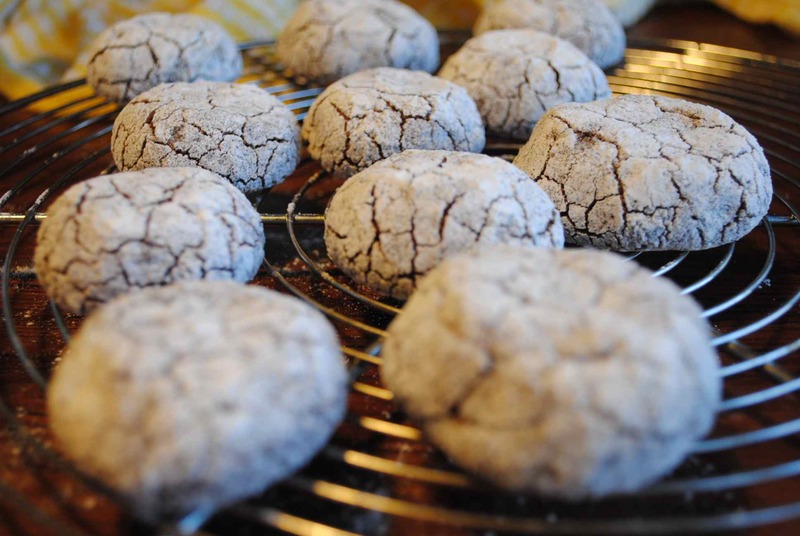 I’d never heard of crinkle cookies before but I am so glad I gave them a try. I’m sure you’ll be seeing other cookies from VCIYCJ as we get closer to the holidays! 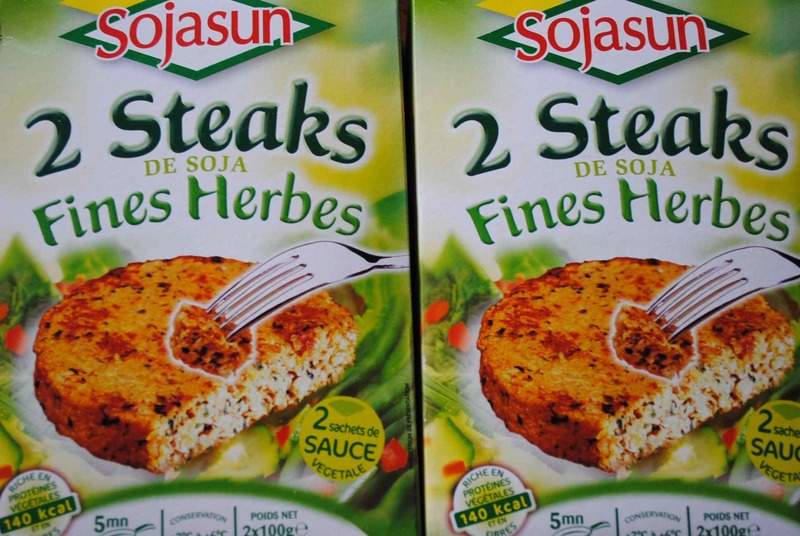 Vegan MoFo Day XXVII : Soja Sun Steaks de Soja or What to eat in France? Soja Sun is a brand name to remember if you’ll be heading to France any time soon – they make everything from veggie burgers to soy yoghurt. We are all fans of everything they make, though they do make some non-vegan things so keep an eye out for the ingredients. These are just good, honest and true tofu and veggie goodness. Guppy likes them with mashed potatoes and peas, and I admit if I’m crunched for time these come in very handy for a quick and nutritious lunch. They are gluten-free and totally vegan, and so is the sauce that comes with them. With only 140 calories each, they are very low in fat and have no trans fats, either. There are lots of different flavours, too. The best thing about the Soja Sun brand is that it’s very mainstream and you can find their products everywhere. This is a big advantage, especially to tourists who need food on the fly, but don’t always know what to buy or where to find it. 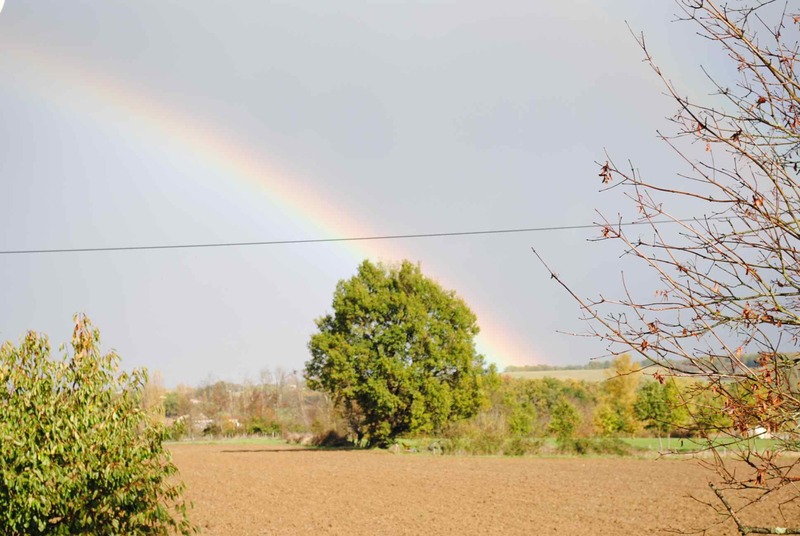 Posted in Uncategorized	Tagged GF, Gluten-Free, product reviews, Soja Sun, vegan, Vegan MoF, veganism, What to eat in France? 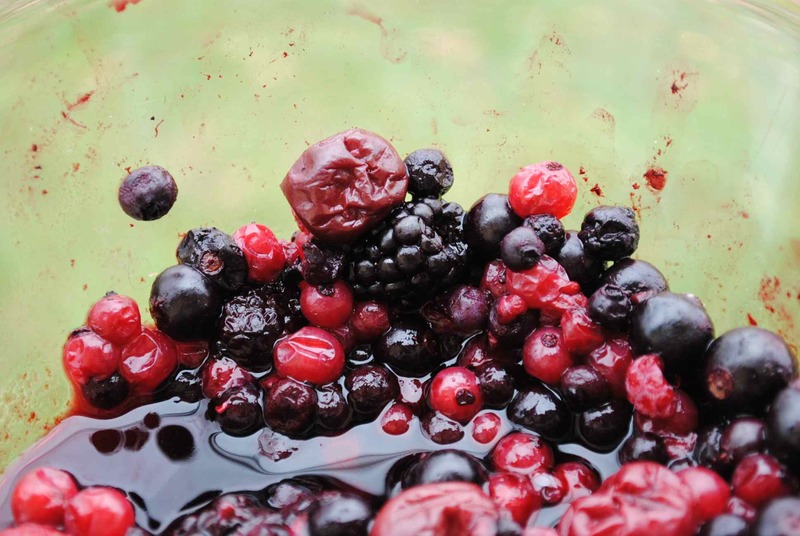 The other day I found myself with some left-over berries when I made the Berry Scuffins, and whenever I have some berries to spare, I make some simple berry compote because it only takes about 15 minutes and it’s so yummy. I enjoy adding some cinnamon because it’s so warming, even a little ginger, perfect as the mornings grow chilly. You can use the same formula with any fruit you’d like (or is in season). 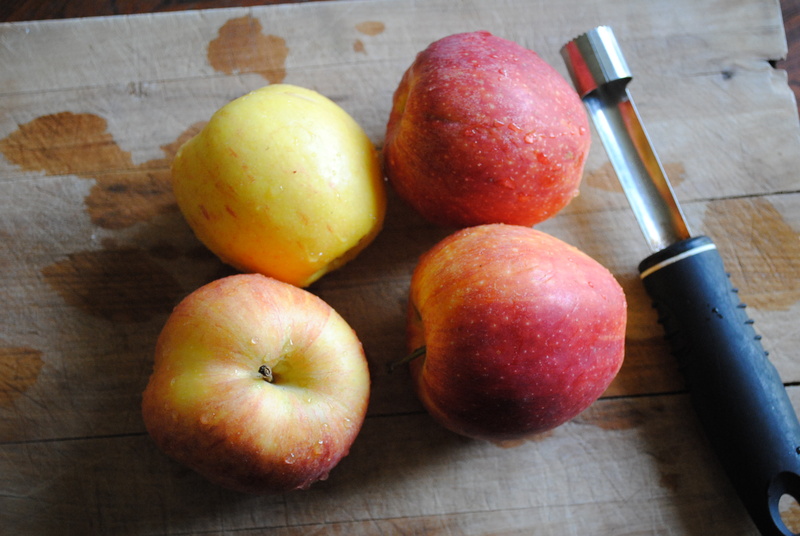 About 500 grams fruit – a cup or two, depending on your fruit, chopped up small for larger fruits. Put your fruit in a small saucepan over medium, until it’s just bubbling, then add the agave and spices. Lower heat and continue to leat steam for about 15 minutes, stirring from time to time. 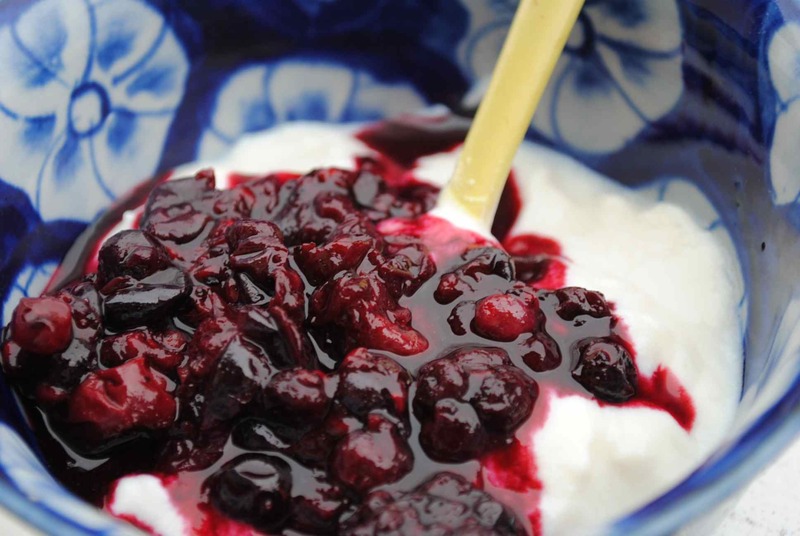 I love this compote on pancakes, scones, yogurt – you name it. Our drawing winners will be announced on November 30th, the last day of Vegan MoFo. Good luck! 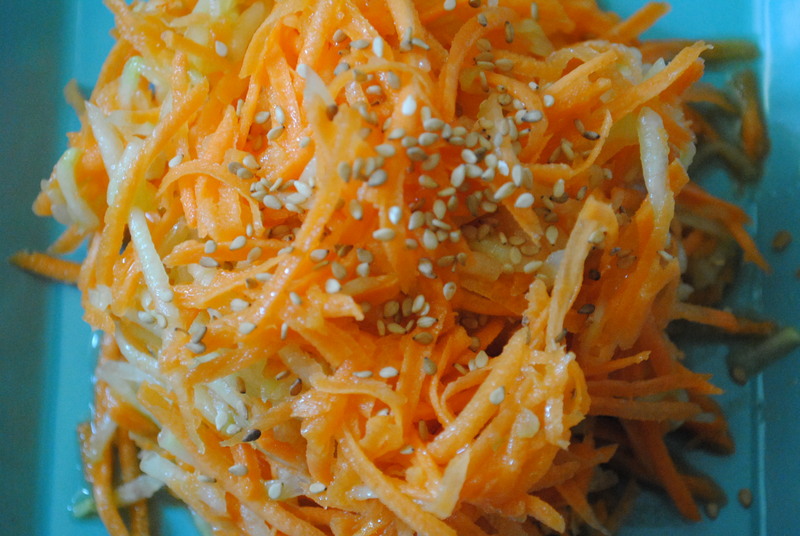 A favourite : simple salad of shredded carrots, cucumbers and sesame seeds with lime vinagrette. Good stuff. We’re almost there, kids! Only six days of Vegan MoFo left. It’s like we’ve reached mile 20 of the blogging marathon, so take in some carbs, a little water, and hold tight! The most frustrating thing about MoFo for me, is that I just can’t take the time to comment on my favourite blogs – too many posts, not enough time. This is W.I.P. Wednesday’s final post dedicated to the creative and talented vendors of the Vegan Etsy team, and what better way to round things off than with some food-related goodness? Sweet V Confections doesn’t ship to France (I wonder why? ), but﻿ if you’re in the U.S. you can actually order vegan goodies! Why not send someone a vegan cookie basket this holiday season? I think just about anyone would be excited to receive 4 dozen cookies…don’t you? It’s probably a good thing they don’t ship here, I’d be ordering myself cookies left and right. These chocolate vinkies should be on every table…at least I think so. They even offer local delivery Ohio people. Who knew? With a name like The Bombshell Bake Shop I’m sure there is a little rock and roll in those treats. You’re not supposed to eat this Pink Grapefruit Vegan Swirl soap from The Vegan Soap Kitchen, but I’m sure it smells delicious. I want all of her soaps – my shower would smell so gourmet. While these aren’t actually edible, I do think these candy cane horns I think they would be really adorable on Guppy, who is all all about costumes, dressing-up and make-believe. 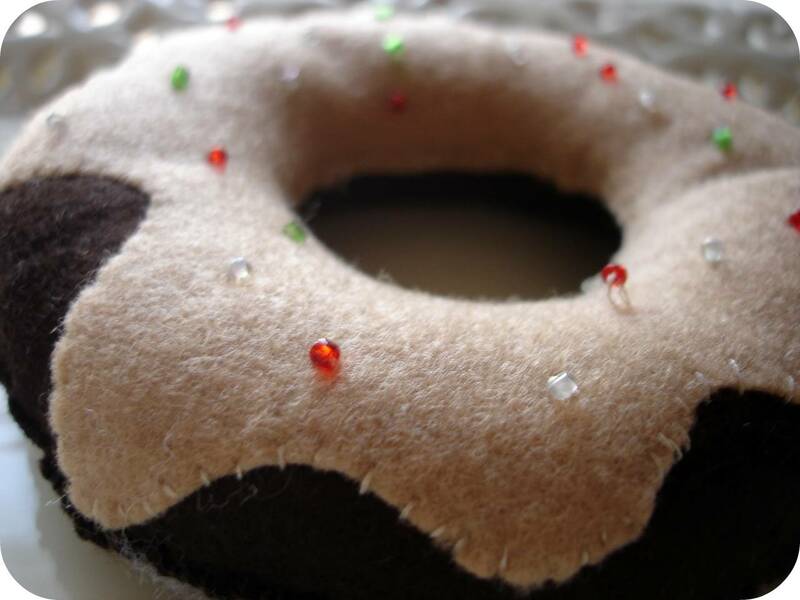 April has beautiful beadwork and other fanciful things in her shop, go look! Don’t forget to keep up to date with the Vegan Etsy Team and their happenings over at their ﻿blog﻿, and remember – a part of their proceeds always goes to supporting animals in need. Have you begun your holiday gift making and crafting? I’d love to know what you’re making me. It’s nearly December already! I receive a fair number of emails and comments from many of my friendly readers asking for advice on what to eat in France. Or what not to eat. Or how to say “I don’t want to eat cheese” in French. You get the picture. I’m happy to say I’ve always responded individually to these inquiries, mostly because that’s just good manners, but also because as a joyful vegan, I’m more than happy to help out. It can be intimidating when you don’t speak or read a language but want to eat yummy, healthy food. I also know that some of you are too shy to ask, so I’m hoping to put a few product reviews up for you kids – we’ll call it the “What to eat in France” series. Just to be clear, these are not sponsored posts, these are just things I like (or don’t like) to eat and you might like, too! 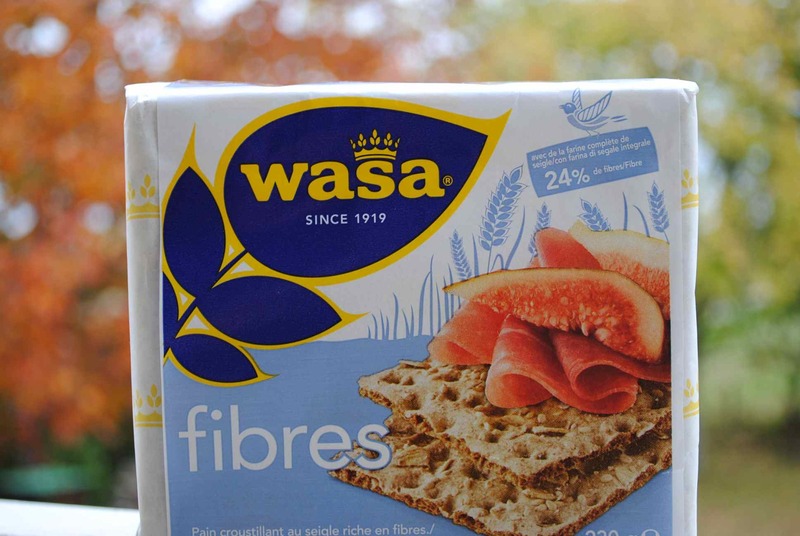 These are my favourite tartines – Wasa toasts with some Bjorg vegetable spread. All-natural, all-organic and super yum. 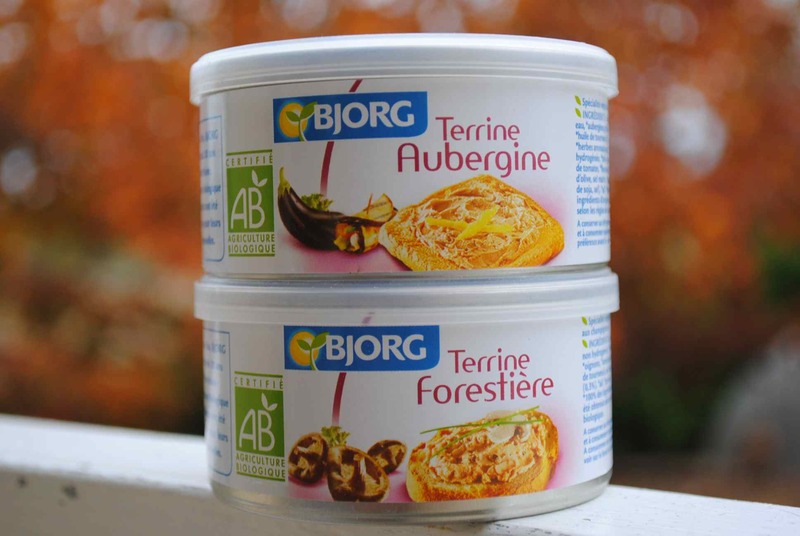 Bjorg makes other flavours, but my two favourites are the terrine forestière and terrine aubergine, “Forest spread” and “Eggplant spread”. They actually both taste pretty similar, and are made mostly of nutritional yeast and mushrooms, but also have onion, potato starch, garlic tomato purée, etc. It’s thick and spreadable like peanut butter, and is considered a little stinky by some, but we don’t notice. Guppy loves these spreads on bread or for a sandwich, so they are kid approved, too. 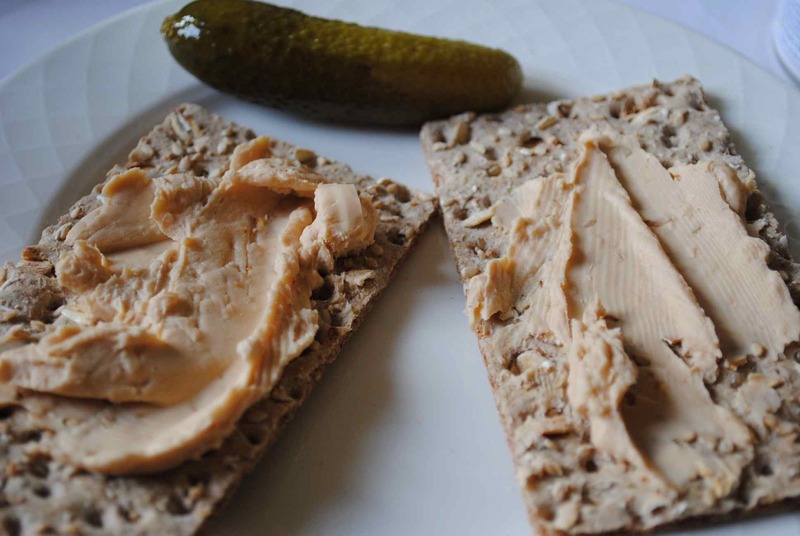 They come in 125g tins that need to be refrigerated after opening, but if you’re looking for a great quick lunch while visiting the sites just pick up a baguette and a tin of Bjorg spread and you’ll have a great lunch for about two adults. Round it out with some fresh grapes or other easily-protable fruit from one of the many vendors you’ll see and you’ll be set. Don’t forget to comment here for some chocolate if you’d like a little taste of France! Posted in Uncategorized	Tagged Bjorg, lunch, product review, terrine forestière, vegan, vegan lunch, Vegan MoFo, What to eat in France? 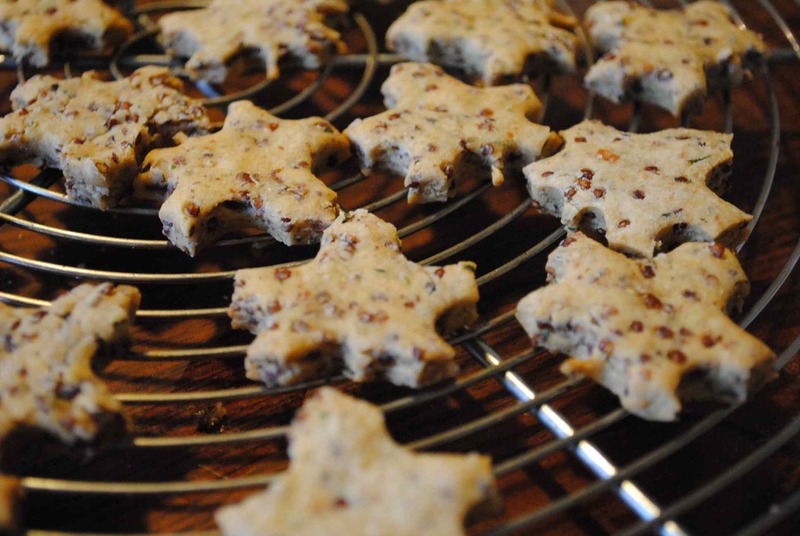 The lovely and talented Amy posted a yummy quinoa cracker recipe over at Tahinitoo and these babies are fantastic! She adapted them from Celine’s famous Cheezy Quackers (one of my favourites) but got all crazy with adding cooked quinoa. That Amy is an upstart and a rebel I tell you. I’m just happy she took a break from baking brownies to give these a spin. 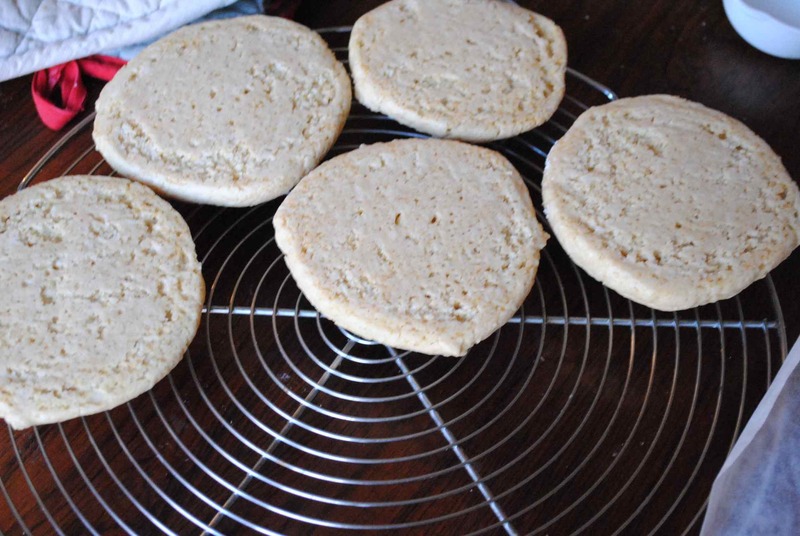 I made lots of changes like using whole wheat flour rather than spelt, doubling the nooch (addict), using cumin, blah, blah, blah. Go see Amy’s original recipe and you’ll be able to make it the way you’d like to. Oh, and did you notice how freaking cute my little leaves are? I know! Libby aka Allergy Mom from the fabulous The Allergic Kid blog sent me the cutest cookie cutters and I was so happy to use them. Now who likes to eat leaves? Why, your friendly neighbourhood triceratops, that’s who! 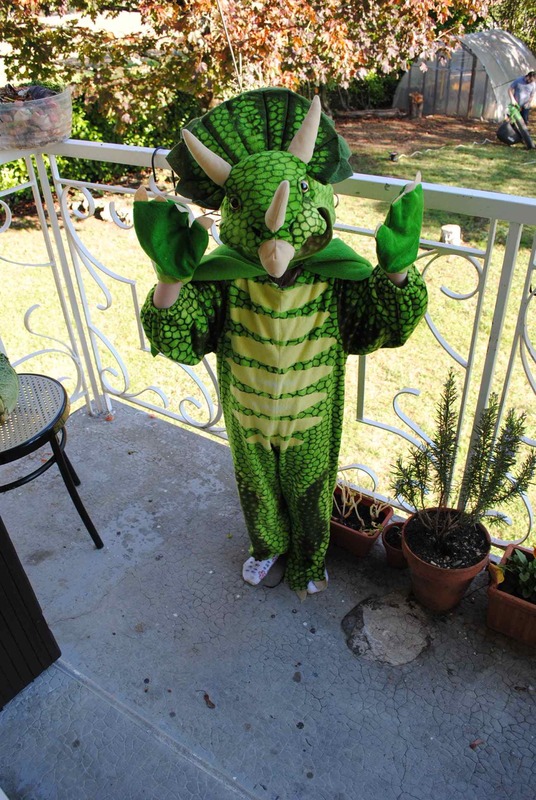 Libby’s son is as crazy about dinos as Guppy, and she kindly thought of us when he grew out of his costume. Libby’s got lots of great recipes, both kid and adult friendly, in addition to loads of great advice and resources for families living with severe allergies. She’s a working/activist mamma who gets major Fishbowl love! Speaking of Fishbowl love, don’t forget to comment here for some chocolate! Who would like a two-for-one meal? 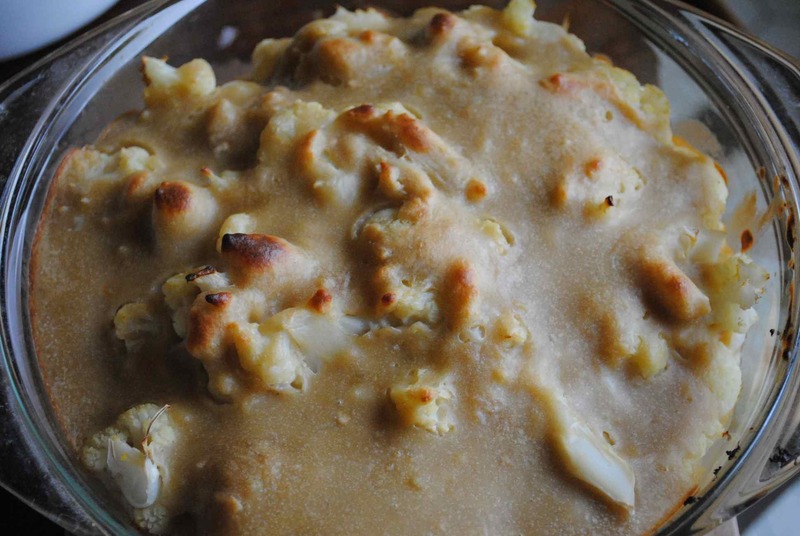 Just steam your cauliflower until tender, then put it into a baking dish and top with a double batch of your bechamel sauce (or just a simple batch if you’ve got a small cauliflower) and bake at about 200°c for around 20 minutes or until it’s browned and bubbly. Serve up with a protein and maybe some green salad. Now you’ve got yourself some left-over cauliflower, right? What’s to do? Make sauce, that’s what! 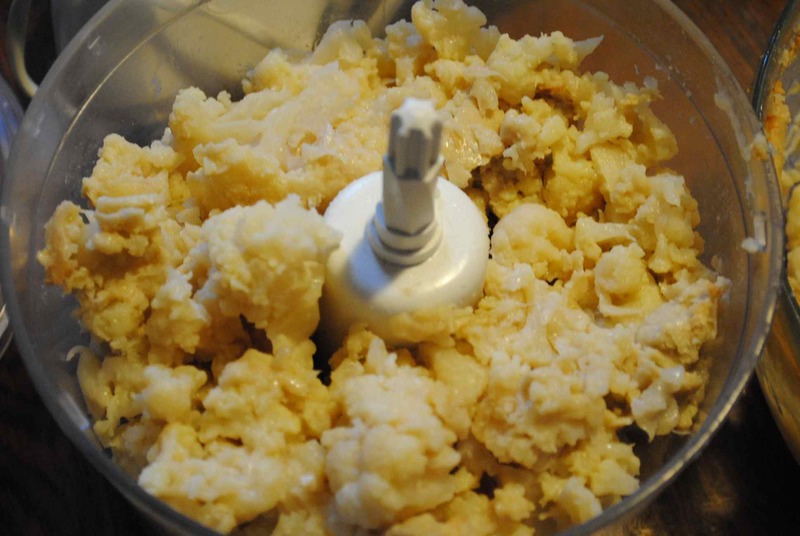 Just put your left-over cauliflower in your food processor and mix it up with an S blade. 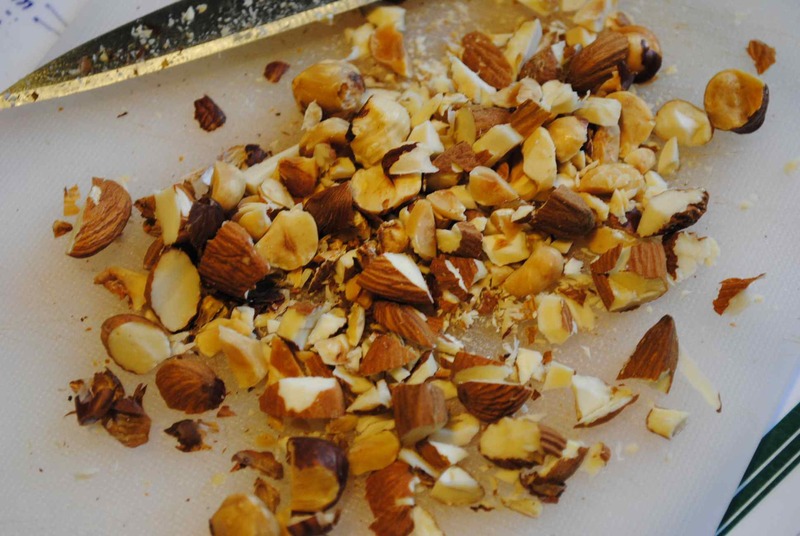 You can add some dried herbs if you’d like, maybe some garlic salt…whatever. If you’d like to thin it out just add a little veg broth or water, but mine is usually just fine as is. 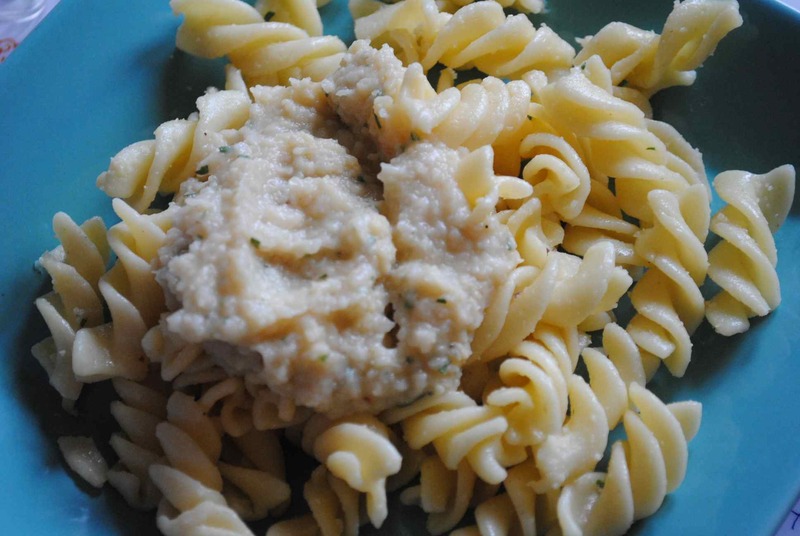 Now you’ve got some cauliflower alfredo sauce. This stuff is really good, kids. Monsieur Fish has a well-established mefiance towards anything remotely health-foodish, and he really enjoyed this. 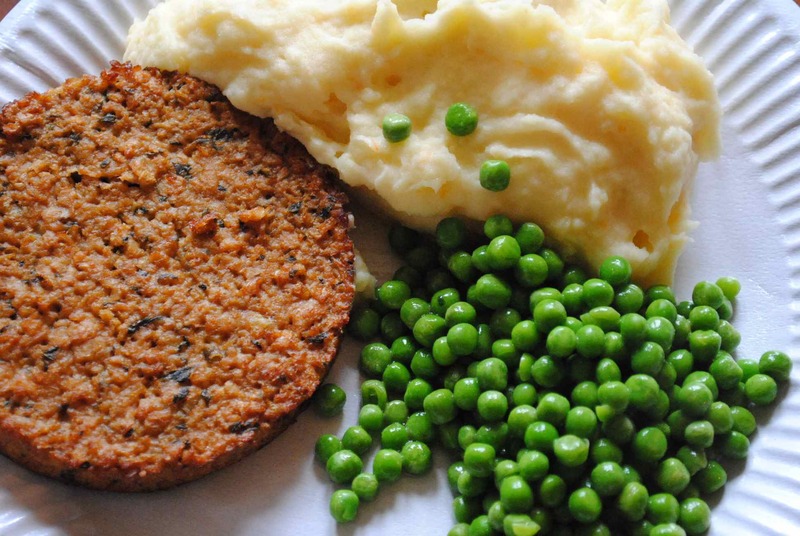 Do you have a favourite way to use left-overs? Don’t forget to leave a comment here to win some free-trade chocolate – you’ve got until next Thursday at midnight France time.